If Ferrero Rocher and Swarovski decided to combine their talents again, but this time with a PC DDR4 RAM manufacturer, the result wouldn't be very different to the G.Skill Trident Z Royal Series DDR4 RGB memory kits. These new memory modules, in kit capacities up to 128GB, are designed for the most opulent "high-class system build" you might have in mind. The headlining feature of these kits is the outer design, but beneath the skin-deep beauty G.Skill has not neglected the high performance it is well known for, and you can bag matched kits of between 16GB and 128GB in capacity and frequencies between 3000 and 4600MHz (with XMP 2.0 profile easy overclocking). 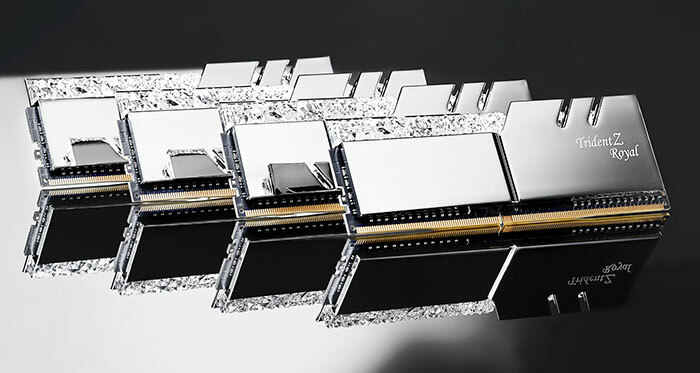 For the ultimate in luxurious impact these new G.Skill Trident Z Royal Series DDR4 RGB memory modules feature highly polished mirror-finish gold or silver heatspreaders, engraved with the 'Trident Z Royal' script. The modules retain the signature G.Skill tri-fin Trident design but the cutout areas in this range are filled with a crystalline structure to refract light. Shining through the light scattering arrangement are 8 individually controllable lighting zones per module. With so many lighting zones, G.Skill says that users can enjoy "smoother colour transitions and an even more stunning lighting experience for your build". Still photos alone wouldn't do justice to this new product range and thus G.Skill has wisely prepared a YouTube video for the launch. Click play below and see a cornucopia of colours and lighting combinations in various systems at various viewing angles. 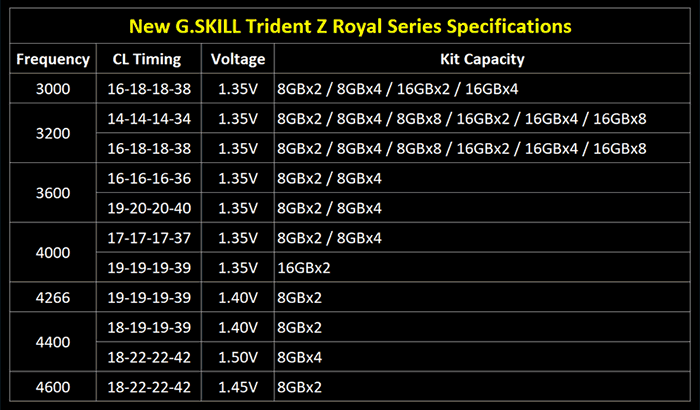 The new G.Skill Trident Z Royal Series DDR4 RGB RAM kits will be available starting from next month from the usual sources. G.Skill hasn't provided any pricing guide at the time of writing. Jewel box style case has USB power so you can enjoy the default RGB lighting show, sans-PC. Now ratified on premium AM4 boards. A couple of US retailers have started taking pre-orders for 128GB and 256GB modules. I suspect this goes well with a golden toilet. Yeah, a great thing to dump this in. A fitting celebration to end another year's successful price gouging. There definitely are some humans out there who go for this kind of design aesthetic. I'm not one, but I applaud the attempt to try something different. I might be interested in just the crystally bit if they could make the RAM look like a Dilithium Crystal chamber, though… Having a Warp Core in your PC would be infinitely better!! Love it. Maybe I'll get this just to put on the wall like a piece of artwork.